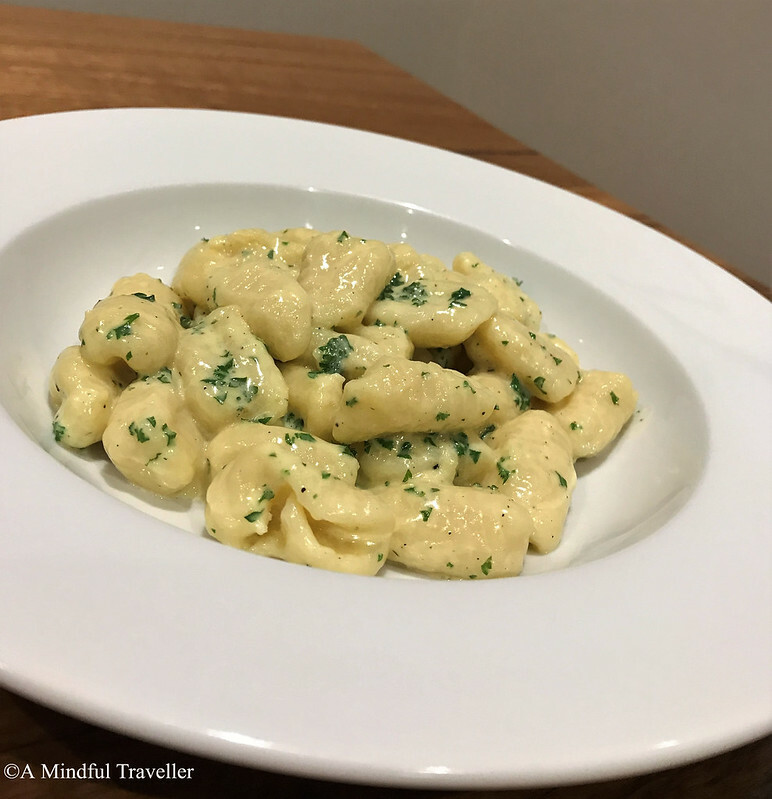 Gnocchi is a regular favourite at our place. In relation to my last post, My Favourite Italian City; Rome, I felt this well loved recipe, was appropriate. 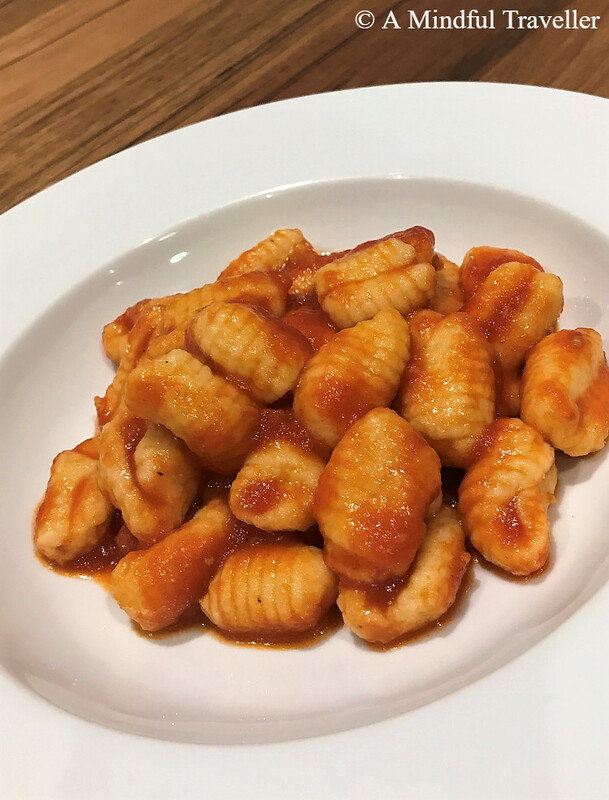 Although Rome is famous for Gnocchi alla Romana ( round, semolina morsels of goodness, topped with Parmigiano-Reggiano, and baked in the oven), this is the traditional potato recipe with a choice of two delicious sauces. Cook the potatoes in salted water for 10 minutes or until tender, and drain well. Mash the hot potatoes through a sieve (strainer or press) into a large bowl with the butter, egg, salt and half of the flour. Mix well. 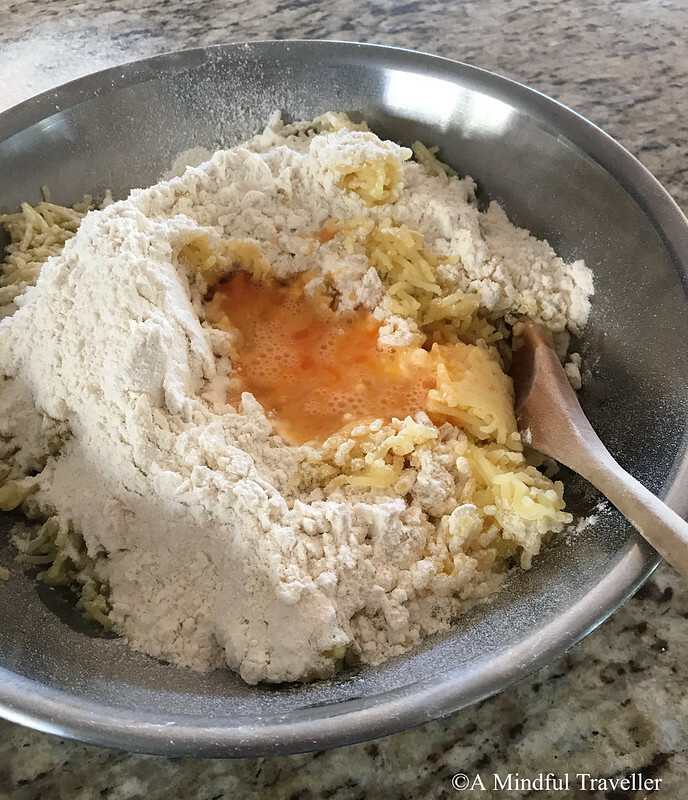 Turn the dough onto a floured surface and knead while adding the rest of the flour. The dough should be soft and slightly sticky. Flour hands and roll dough into 2cm thick rolls and cut each piece into 1 cm pieces. (You can see example in picture below). Press the tops of each piece with floured prongs of a fork or a wooden gnocchi paddle, to make the lined pattern. 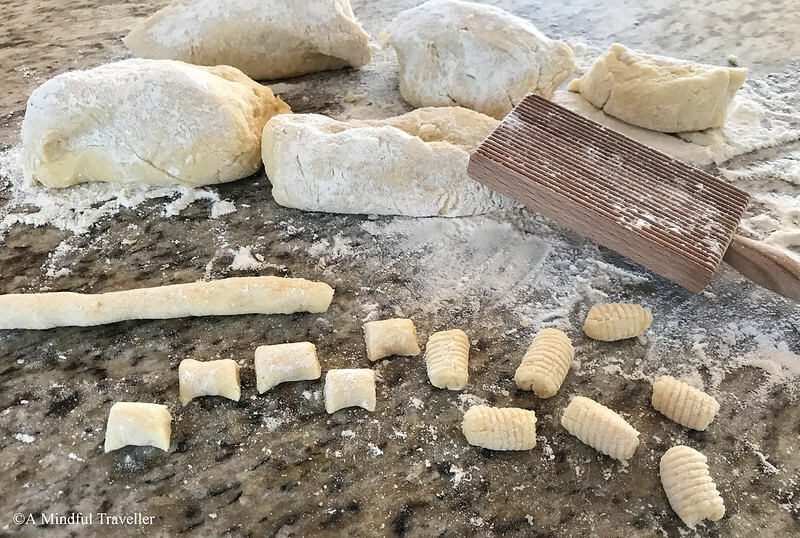 Keep gnocchi spread out on floured trays or cloth. Saute onion in olive oil until soft. Add garlic. If you like a bit of heat, I add half a teaspoon of my chilli paste (recipe here) at this point. Add the tin tomatoes, passata, and basil and season to taste. Stir and cook for 20 minutes. Serve with the gnocchi and top with grated parmesan cheese. Saute garlic in olive oil and butter. Pour in the cream and simmer. Take pan off the stove and stir through cheese, gnocchi and parsley. Add salt and pepper to taste. Oh my, this recipe sings to me and how I wish I owned a gnocchi paddle. You can be sure this will get made soon. It’s one of those dishes I suppose Carol. keep forgetting gnocchi is potato and not pasta haha! Now I’m craving gnocchis….looks delicious! 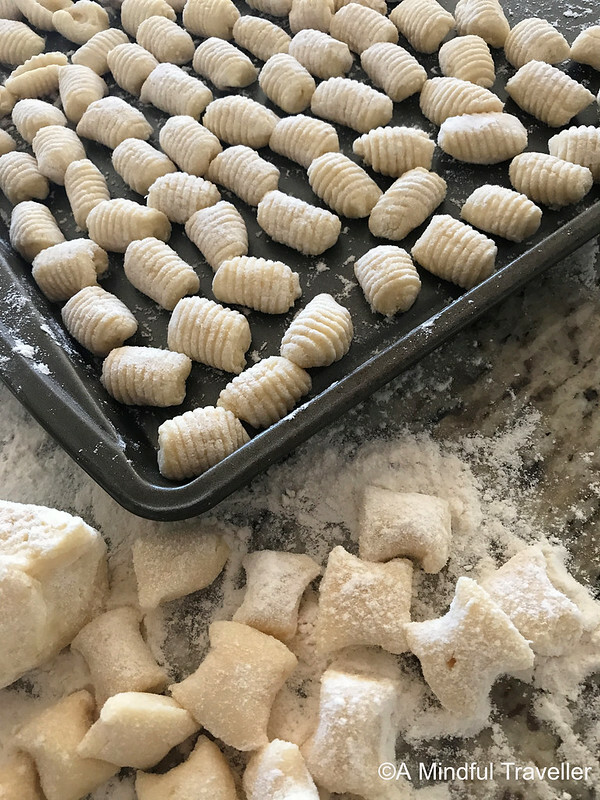 I absolutely loooove gnocchi and this recipe looks great! Gnocchi and pesto is my favorite! This looks so yummy, I have never made it myself. Looks like I will be giving it a try soon! Ooh I’ve always wanted to try making this, and I didn’t realise that it was so easy! Thanks for sharing! That looks so good! Reading your post and seeing the pictures is making me crave some right now even though it’s early in the morning here! Lorelle, this stopped me in my scroll. Could have used this when Mom was here. Still, I actually try it. My Nana made gnocchi, but nothing is written down. Of course. Oh, then I should have posted it earlier Lorna, damn! Never mind. Mom wouldn’t have made it anyway, ha! We still have the makings of pizzaiol’ in the freezer, but it isn’t actually made. OK – I will have a go and let you know what happens! This looks super yummy! I’ve bought gnocchi in the store, but never made the dumplings myself. It does look easy the way you described it. One thing I recently tried and liked was instead of boiling the gnocchi, I sautéed them in butter. They took on a really yummy golden crust and, of course, butteriness. Not so healthy, but really good. Thanks for giving me confidence I could make a gnocchi on my own! My husband loves this meal and I have never attempted cooking it. I must show it to him so we can have a go. Thank you! Yes, I have tried making this yummy dish and it worked out well as no food was left on the plates. The flour in Europe seems to be more superior in quality than NZ or Aussie brands. No doubt why the French bread is so good!! This gnocchi looks so wonderful, it made me a little hungry reading your post. This looks delicious 😊 making things from scratch can be so therapeutic – it might take longer but the end result is so worth it!! Now I’ve a craving for potato haha! This looks great. I’ve never made gnocchi, but it doesn’t seem so hard, I may give it a try, it would be good to do with the kids. I’m not sure I have ever eaten gnocchi…am I abnormal? I’m always looking for new things to do with potatoes though so might just give this a try this week! Looks delicious! I just might make this one day. Looking delicious! I haven’t tried making gnocchi yet. Must do! The fact that you made them from scratch deserves a thumbs up. T’m always too lazy to do it, and I buy them ready made :)). I love gnocchi, but my favorite sauce is brown butter sage. Wow you really are talented on many things Lorelle. This one looks super yummy. Looks so delish!! I always wondered what tool was ysed for the little stripes on the gnocchi!! Thanks Amanda, you can also use a fork if you don’t have the paddle! Oh yes, but it wouldn’t look as authentic! I’ve only tried gnocchi once, it was pre made and I wasn’t sure about it. This looks tasty though, maybe I should give gnocchi another chance!